This is the old, first version. Synod 2010 approved a revision for provisional use. Log in to the URCNA website and find the liturgical forms committee link which will have the updated version to use. Thanks Danny! I updated this post with the current version. Hi Brian, you probably don’t expect to be getting a comment four years after posting on your blog, but I wanted to say thanks for this post. 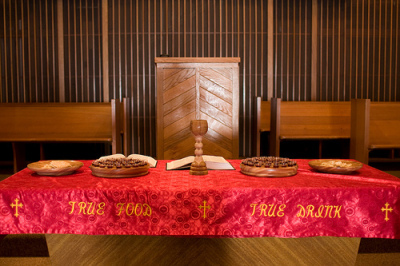 I’m the pastor of a confessional Presbyterian congregation in Sydney, Australia, and a year ago I found your site as I was searching for the URCNA form of the Lord’s Supper. I have been using this liturgical form ever since, and my congregation (and I!) are very thankful. I agree with you on its beauty and helpfulness. While I’m thinking of it, do you know where the other URCNA liturgical forms are online? Or can they only be accessed by URCNA officers? Is there a hard copy book I could purchase? I don’t want to breach copyright (if in fact a denomination can copyright its form of worship) or otherwise deprive anyone of due compensation so I am happy to purchase an actual book or document. If you could point me in the right direction, I would be very grateful. Thanks for writing and letting me know that this form has been an encouragement to you and your congregation. I am very thankful to use it when we partake of the Lord’s Supper. As for other liturgical forms of the URCNA, you can find them in the public “Acts of Synod 2014” starting on page 205. At this point they have been provisionally approved by the URCNA for us in the churches. At Synod 2016, Lord willing, the work of our liturgical forms committee will be done and we will officially approve their whole work and begin to publish our liturgical forms, likely in the back of our new Psalter Hymnal that we are working on with the Orthodox Presbyterian Church and/or in a separate document. As for copyright issues and whether it’s ok for you to use these forms, I don’t see why not. But I am checking with my friend Rev. Daniel Hyde who is chairman of the liturgical forms committee. thanks for this. I have located the report of your liturgical committee and I look forward to having a read of it in the coming days. If you do find out anything pertinent to copyright, please let me know. And send my greetings and appreciation to Daniel Hyde too. I am thankful for his work on images of Christ (the name of the book I cannot remember right at this moment) and also for “Welcome to a Reformed Church” which I have distributed to visitors and newcomers at my church, and have recommended via a review in my denominational magazine. With many of my fellow pastors here in the PCA (Australia), I am very thankful to God for the ministry of the URCNA. BTW, what is the name of the church that you serve? Hi Brian – Penshurst Presbyterian Church, Sydney is where I’m at. No website at the moment, but https://www.facebook.com/PenshurstPC. Feel free to get in contact or stay in touch. Again I’m so thankful for so many men from your denomination and particularly the WSC guys. I had the privilege last year of auditing a week long intensive with Michael Horton at the Presbyterian college here in Sydney.